It’s official I’m officially free of the old job. Yesterday was my last day at the firm. There are several people I will miss, but staying in touch isn’t hard. And there are several people and things about my old job I won’t miss at all. I look forward to reacquainting myself with freedom. Last night I went to see Clutch with Bama. I love this band. Although they don’t have the most rockstar looks for a band, they definitely rock out! The lead singer is incredible, great voice. He also has an extremely intense stare. It’s a little unnerving, but their sound definitely makes up for it. I think Bama enjoyed it for the most part, even if the singer’s looks were even more spooky for her. Also, we got to witness a very large man take down another guy. The jury’s still out on whether the large guy was a bouncer or it was just a fight. Hopefully he was the bouncer, because I don’t think anyone could bounce him. And it’s official, I’m out of the country! I flew to Detroit today and Barbie picked me up at the airport. We stopped at a Coney’s diner and had some cheap diner food to get the Michigan experience. 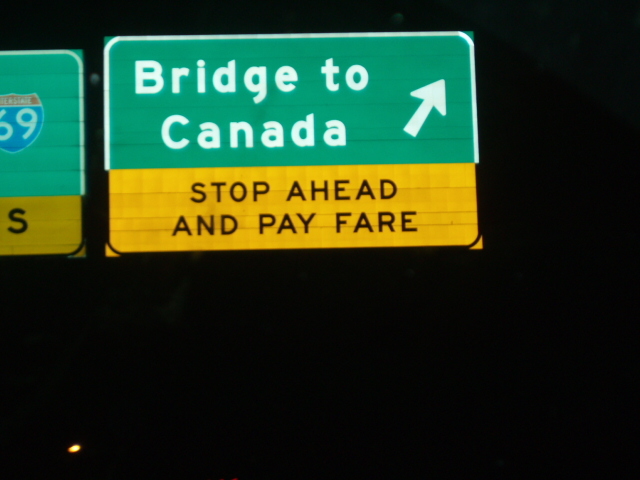 Then she took me across the border to Canada. Border crossing was way simpler than I thought. They didn’t even look at my passport. So much for stressing out about it. When we got to town, she drove me to the university so I could see when she works and studies. Also, I may be riding the bus all by myself tomorrow to meet her over there, so hopefully I can do it in the daylight. And to answer the question on everyone’s mind…Yes, it is cold here. It’s not freezing, but it is certainly not warm. But as everyone back home knows, it turned pretty chilly there today too. More tomorrow. We have some great things up our sleeves….I mean planned. Stay tuned!